PM Imran Khan said Pakistan was willing for any investigation and asked India to give proof to back its allegations of an ISI link to the Pulwama attack. 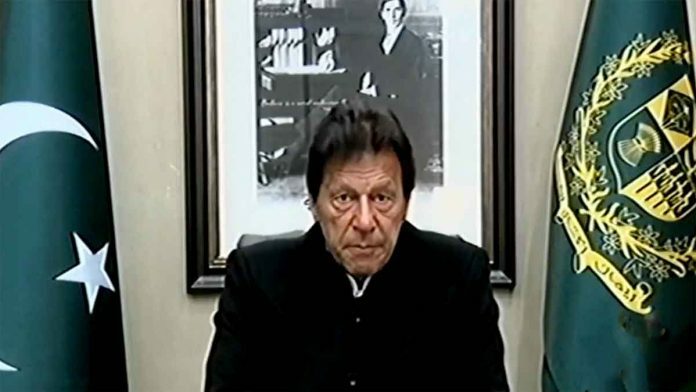 New Delhi: Pakistan Prime Minister Imran Khan said Tuesday that Islamabad will “not think twice before retaliating” should India plan to mount an attack in the wake of the rising public anger after the Pulwama terror attack that left 40 CRPF personnel dead. Khan also urged a dialogue on the attack, for which the Jaish-e-Mohammed has claimed responsibility, based on “actionable evidence”. He said: “We are now hearing Indian political leaders through the media that they want to take revenge and strike Pakistan. Firstly, I wonder where in the world there is a law which allows an individual or a country to become the judge, jury and the executioner? “Secondly, I understand this will give you a huge boost politically as you near the elections. But if you think you can attack Pakistan, then Pakistan will not think twice before retaliating. There will be no other action left for us but to retaliate. And if that happens we all know what will happen. It is easy to start a war, that is in the control of man, but not its end. Only God knows where it will end. He said if India believes the attack was carried out by terrorists based in Pakistan, then his government is ready to assist India in the investigation. He also asked the Narendra Modi government to share “actionable intelligence” on the attack, even as he stressed that his government will do this not because it is under some kind of a pressure, but to defend and protect his own country from such terrorists. “We are ready to help India in any kind of investigation or probe on this matter. If you have any actionable intelligence that indicates Pakistan is involved then share it with us. It is my personal guarantee that we will take action on that. We will take action not because we are under pressure from someone, but because we feel this is an act of enmity against Pakistan as well if a terrorist is using our soil to conduct its operation. This is against our own interest,” he said in a video response issued five days after the Pulwama attack. Why the delay in response? The Pakistani Prime Minister said he took time to react because he and his team were busy preparing for the visit of the Crown Prince of Saudi Arabia, Mohammed bin Salman, who concluded his trip to the country Monday. He added it was unfortunate that before the Indian government could verify why such an incident took place, it started blaming Pakistan. He said Pakistan only aims to bring peace and stability in the country, as it has suffered acts of terrorism the most. “And even if the visit was not taking place, what will Pakistan gain out of this? We have tolerated 15 years of terrorism in which 70,000 Pakistanis were killed. And why will we do such a thing when we are looking at peace and stability in Pakistan and taking steps towards it? What will we gain?” he asked. Khan said New Delhi needed to stop making Pakistan a “whipping boy” and should resume the dialogue with Islamabad if it truly wants to solve the Kashmir dispute. “I want to ask the Indian government that if you want to remain in the past and keep blaming Pakistan for every mishap that happens in Kashmir, then start a dialogue and take adequate measures in Kashmir. This way, you will continue to keep Pakistan as the whipping boy,” he said. Pointing towards the stance that the US government has taken in bringing peace in Afghanistan after waging a war there for 18 years, Khan said this is the only way. Khan’s remarks came a day after his government called back its High Commissioner to India, Sohail Mahmood, for consultation. This article has been updated with more quotes from Imran Khan’s statement. 1. My first reaction to what PM of Pakistan is this: he is simply pretending not to know that terror groups like Jaish-e-Mohammad (JeM) operate freely from Pakistan and that they are in business of creating trouble in India. 2. As it is we know that JeM has already claimed responsibility for the PULWAMA suicide attack. Question is this: Can we ever trust PM of Pakistan and the Pakistani establishment to eliminate bases of terror groups like JeM? Answer is an emphatic NO. 3. I think our political leadership and more particularly, former chief ministers of Jammu & Kashmir, Ms Mehbooba Mufti and Omar Abdullah should be very clear as regards ground realities with reference to the Kashmir issue. Realities are: (a) Pakistan’s army and its intelligent wing ISI will continue to give logistics, equipment and financial support to terror groups like LeT, JeM, and Pakistani Taliban. (b) Ordinary people of the Kashmir valley have been brainwashed by the separatists. (c) Politicians of Kashmir as also the ordinary people of Kashmir valley simply fail to understand that Pakistan would never give azadi to Kashmir. 4. India has to make sustainable efforts to minimize impact of activities of terror groups and for that our Army needs cooperation from ordinary people of the Kashmir valley. 5. Considering this scenario, I believe that it is for the separatists & people of Kashmir valley to decide what they wish to do: To wholeheartedly support our Army to so that terrorism is wiped out from Kashmir or to join those who provide support to terrorists and get killed at the hands of terrorists and terrorists’ supports. 1) I find this extremely strange: DOES PAKISTAN WANT BJP TO WIN THE NEXT ELECTION SO IT HAS OFFERED THEM A LEGITIMATE EXCUSE TO LAUNCH ONE MORE SWIFT SURGICAL STRIKE AND BY THAT GREATLY IMPRESS ALL INDIANS WHO ARE GOING INTO ELECTIONS PRETTY SOON???? 2) Or, has Pakistan laid a TRAP for India; it wants Narendra Modi to walk into it so Pakistan can, this time, react with great ferocity, who knows, perhaps even with a concerted attack from China on the Eastern flank, to give a bloody nose to our beloved country — only to ensure that Narendra Modi and his BJP stand completely disgraced in the eyes of Indians for all times to come?? 3) Or, in the complete list of possibilities, remote and not-so-remote, there is one more shrewd arrangement of pawns on the chessboard that cannot be rejected out of hand — the Pulwana blast was unwittingly encouraged by LOCAL SYMPATHIZERS of the present government when they saw it losing ground due to incessant criticisms by the opposition, including about the Rafale, by DELIBERATELY IGNORING THE FACT THAT THE CONVOY MOVEMENT WAS OCCURRING SO CLOSE TO AFZAL GURU’S DEATH ANNIVERSARY, believing that some terror attach will create a surgical strike type possibility which will give the government a nation-uniting narrative, foolishly not realizing that the attack MIGHT TURN OUT TO BE SO HUGE??!!! I don’t mind if anyone calls me names for thinking up the third possibility. I am not alone in this; there must be thousands and thousands of we Indians who must be mulling this suspicion in their mind. No one can call ALL OF US “desh-drohis”!! Of the these possibilities listed above, 1) does not look likely to me, though that is the one being drummed up the most, indirectly, by the establishment and its supporters when they talk of “teaching Pakistan a lesson”. Possibility 2) is a great, possible danger. It will change nothing on the Kashmir front, that problem will still remain, though we will stand a REAL CHANCE of losing Arunachal Pradesh. Naveen, I differ with you on one point for sure, that I lack common sense! Isn’t point 1) based on common sense? Would anyone say that Pakistan has done it as a “standalone” act, knowing fully well that it would strengthen BJP’s chances with the voters? From this follows point 2) that, no, Pakistan hasn’t planned it as a standalone act but as a “bait” for India, so India can get trapped in a war in the west, and then be forced to fight a simultaneous war on the eastern front with a much stronger adversary, China. Both the points 1) and 2) have low probability in my opinion, because China will very likely refuse to play ball because of its own economic problems at this stage. Yes, I agree with you that we have had “Jaichands” in our society. But individuals of that mentality, you will agree, are in every society at every point of time. Sanjiv, I differ with you on many counts. But before I being I say that I’m neither BJP or Congress supporter. I support any party that takes India towards greatness, not in philosophical terms, but in actual reality. My analysis is that Pakistan is getting encouraged because the US is about to leave Afghanistan and Pakistan knows that they can divert terrorists again towards India as they did in 90s. This attack is a sign of things to come and we should be prepared as a nation. Pakistan isn’t clever enough to bait India into anything. and I also think that there is no option of war between India and China for a foreseeable future. We have to admit Pakistan has a deep hatred for India for historical reasons as articulated by former Pakistan ambassador to the US Mr. Haqqani. I think the Indian media was quite strong in 2008 during the 26/11 attacks. But the Lutyens hate Modi for their own reasons. I agree that Modi does lots of chest thumping probably because he doesn’t have Lutyens to favour him and he is not coming from a political dynasty. Because of the Godhra riots he has low approval among left-leaning intellectuals. I was also very apprehensive of him in 2014, but in all fairness, he has done far better than his predecessors. This is coming from someone who never liked BJP and still hates RSS a lot. My only argument is that we shouldn’t ignore the obvious in trying to be very clever. What is clear that Pakistani state, especially its army, hates India for historical reasons including Kashmir. Neither this hatred will go away nor we will become good neighbours. The only possibility of peace between India and Pakistan is when one of these, hopefully India, dominates and calls the shots in the region. However, China makes things far more complicated. We should keep our house in order and speak in one language to the enemy. Also we should remove article 370 as it is a temporary provision in the constitution and let Indians settle in Kashmir. Only then we can retain Kashmir. Otherwise, we leave the scope of secession open and Kashmir will always burn. Talking about these things complicates things.